Our Team of Certified Geese Management Professionals Has the Experience and Know-How to Effectively Manage Your Nuisance Canada Goose Population. There are many aspects of geese management to consider when trying to alleviate your nuisance goose conflicts. Our Certified Goose Management Professionals are trained in all aspects of geese management. This allows us to design and implement an integrated geese management program. Our integrated goose management programs take into account seasonal needs of geese and incorporates the most effective control methods. Over 10 years of experience managing Canada Geese. 8 years in the Class A commercial office and residential property management fields. 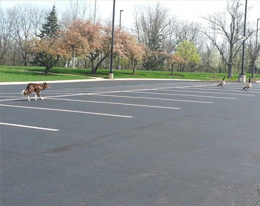 *Ohio law requires every company and person performing goose control services for hire to be licensed by The Ohio Division of Wildlife. Stalk and Awe in the News! There are many aspects of geese management to consider when trying to alleviate your nuisance goose conflicts. Our Certified Goose Management Professionals are trained in all aspects of geese management. Contact us today to schedule a free site inspection where we can determine the best solution for your property. We service Dayton, Cincinnati, Dublin, West Chester, Centerville, and the surrounding Ohio Valley region.